Our last European adventure started in Amsterdam for a week, when I escorted a group of friends. Our group then scattered all over Europe. Some went to Paris. Some went to Rome. My wife and I flew to Prague with two other couples. My Amsterdam trip report can be found elsewhere in this blog. Before I start. Let me tell anyone considering a trip to Prague that your first step should be to buy Rick Steve’s book on Prague. We used it as our bible, and it never steered us wrong. The six of us flew from Amsterdam to Prague via SkyEurope. The tickets were extremely cheap, under $60.00 per person. We purchased them online at http://www.skyeurope.com/. Their list of destinations is short, but we found the service to be quite good. It kinda felt like Southwest here in the States. Not a lot of frills, but the plane was clean, and the staff was very friendly. You do have to watch the tight luggage restrictions, though. But we were forewarned and packed accordingly. The flight is kind of like being in the audience of the Home Shopping network. The flight crew had everything for sale from chocolates to Swiss watches to travel gadgets. The beverage cart rotated with the merchandise. We got a kick out of the whole experience. We rented apartments through a rental agency: http://www.prague-city-apartments.cz/. They came with a free transfer in. This was a very good thing, because we arrived at 11:00 PM and the airport was deserted. We do not speak Czech, and really had no idea where our apartments were from the airport. Details regarding the airport pickup were sketchy, and my emails were not responded to in the last couple of days prior to our flight. So it was a relief to see the guy at the almost empty airport holding a sign with my name on it. We piled into his nice clean Mercedes van, and it was off to our apartments. Once there, we met up with another couple who had flown in from the States earlier in the day. I should mention our group of travelers. My wife and I have been lucky enough to fall into a group of friends / traveling companions, that have proved to be a perfect match for us. We have traveled with everyone on other trips. But this was only our second trip to Europe together. Our little group of four couples are all fast friends, and easy companions. We all love travel, and usually are up for anything. Traveling with a group can sometimes be problematic. But that is not so here. We have never had any drama. Nothing can be better than finding the right group of travel mates. We are working on a trip to Italy soon. “Old town” is the area that you always hear about in Prague. We rented four apartments in the “New town” section of Prague. This turned out to be a perfect choice. Old town is the tourist section of the city, and can be very crowded. All of the bars and restaurants in Old town cater to the tourist trade and are more expensive. We found better prices on food and drink in New town, and enjoyed the more local crowd. It was only a short walk to Old town when we wanted to do the tourist thing. We also found that our section of town (more below) turned out to have quite a lively weekend scene. Several of the small bars nearby had live music on Friday and Saturday nights, and there were some excellent restaurants in the neighborhood as well. New town was the site of widespread demolition of ancient buildings in the 1900’s. Sad as that sounds, they were replaced by art deco buildings. Some of these are magnificent, and every single one seems to have great statuary or bas relief, or some other kind of elaborate decoration. One of our group members loves to photograph architectural details. He had a huge camera lens, and was a little overwhelmed by the sheer volume of subjects. Our studio apartments were all more or less the same, and cost us about $100 per night for each. Each came with a bath, full kitchen, and living room / bedroom combo. They were not luxurious, but very clean. My only real complaint was the thin threadbare towels. We only got two of them, and they were changed out twice during our week. But all in all, the apartments were very livable and were the perfect home base for our stay. Our group adapted quickly. So it quickly developed into an almost dorm like atmosphere. Lots of popping up and down the stairs for morning cups of coffee (sometimes in bathrobes), or bedtime nightcaps after an evening out. These were the Opatovicka apartments, on Opatovicka Street. Very close to the National Theater (http://www.prague-city-apartments.cz/product/gallery_en_OPATOVICKA_APARTMENTS.html). I would stay there again. On our first real night, we stopped for “one beer” at a local pub. What a mistake that was! But in a good way (I guess). We stopped at the Styl, a small bar and restaurant up the street and around the corner from our apartments. We got to know the waitress and chef working there. Delightful young people in their twenties. We quickly developed a very friendly rapport with them. We told the chef (Peppa) to just feed us, and feed us he did. We had a wonderful meal and too many drinks, including real absinthe. I won’t bore you with details of our evening here. But suffice to say that Peppa was serving flaming drinks, and occasionally would spill one to light the whole bar on fire! He was ex Czech military, and in great shape. As we could tell by his skill at turning cartwheels across the restaurant floor. What a night! Our behavior was bad too, but I ain’t tellin! Hmmm, maybe there is a reason that absinthe was once outlawed in the US! But our meal was awesome. We returned later in the week for another meal. One of the members of our group was celebrating her birthday. Peppa served some of the best duck I have ever tasted. If anyone wishes to visit the Styl, be aware that the name is not on the front of the bar. There is just a Budweiser sign. It is located on Opatovicke St., just after the street makes a bend towards the river. Free Wifi (wee-fee) here too. Another benefit to our location was close proximity to a major tram stop and the Tesco department store. Tesco was pretty handy. They are actually like the Walmart of the UK, and recently opened a store in Prague. There is a grocery store in the basement, and just about anything else you need on the other three floors. We were able to buy coffee and snacks there to stock the apartments. The Tesco shared a building with the tram station. Here is a secret that I learned from Rick Steve’s excellent guidebook. There are two “tourist” trams that leave from here. They take a loop past most of the things that you wish to see in Prague. They go past the National Theater, across the Vltava River to the Little Quarter and Prague castle. You can buy a 90 minute ticket with unlimited transfers for about a buck, and just take a ride. Then make your stops at the castle, the funicular up Petrin hill to the tower, the Church of St. Nicholas, The Monument to the Victims of Communism Who Survived, etc. There are lots of reviews of these sites elsewhere, and this is getting long. So I will let you do your own research. But every single one is worth looking at. It would be hard to pick a favorite. You want to ride on tram #22 or #23. For some reason, #23 was always less crowded. Our only bad experience was that one member of our group was pick pocketed while taking pictures of the changing of the guard at Prague Castle. We all knew this was possible, and took precautions. But it still happened. Be careful y’all. These guys are good. Fortunately, there was no cash in the wallet. He had to cancel his credit cards, but his wife still had hers. So he barely missed a beat. But Prague Castle and the St. Vitus cathedral were still the highlights of our trip, and not to be missed. We enjoyed Old town as well. Lots of little cobblestone lanes. Easy to get lost, and impossible to navigate. But we had fun trying. This is where you find the famous Astronomical Clock, interesting shops, and fun restaurants. But this is the priciest place in the city to eat or drink. After a morning on our own, Melissa and I met up with our group to watch the clock perform. The sidewalk cafe served us what we dubbed “the most expensive beer in CZ.” I think it was about $6.00 for a draft. Triple the price you would pay elsewhere in New town, and about four times what we paid at our local pubs. We shopped hard for crystal, and found the best prices at Crystalex, just off the Old Town Square on Male Namesti. The old Jewish cemetery is not far from old town, and one of the most interesting and somber places I have ever been. This is sacred ground, and it is estimated that as many as 100,000 people may be buried (in layers) in this tiny plot. Maybe an acre or two? The cemetery is centuries old. In addition, thousands of Jews “disappeared” during the Nazi occupation of Prague. The old Synagogue here has every single name listed on the walls. The names are in small print, and cover every wall. They also have exhibits of the holocaust children’s art. I had been to the Anne Frank house not long before my visit here. The Frank house made the holocaust personal. The old Synagogue brought home the sheer enormity of this tragedy. It is something that I will always remember. On a more cheerful note, we attended a classical concert at the Rudolfinum. This is where the National Symphony plays. This night, there was a twelve piece string orchestra. It was expensive, and the music was “top forty” classical. By that I mean the most popular pieces, like Bizet, Pachobel, Vivaldi, etc. But the musicians were from the National Orchestra and very professional. It was extremely well played and the concert hall was a jewel. So it was worth the price. We also hired a van for a day trip to Kutna Hora, about two hours from Prague (Google this.) What a wonderful and strange day this was. There is an Ossuary there that contains the bones of 40,000 people. These are victims of plague and war, dating back to the 1300s. They have used the bones for decorating! 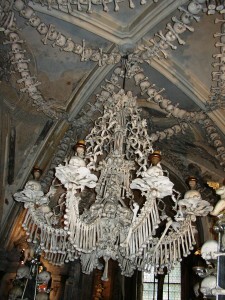 There are bone chandeliers, wall hangings, pyramids, etc. Very macabre and fascinating. Our driver knew of a great little restaurant here. 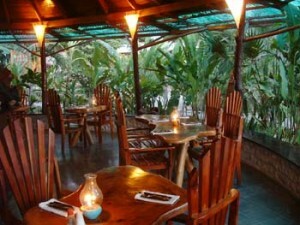 We had another fabulous and inexpensive meal, and had big fun kibitzing with the owner. We also visited the beautiful little town of Sedic, with its magnificent Gothic church that was built in the fourteenth century. Our driver was a very interesting character. I couldn’t really call him a guide. He spoke almost no English, and was an insane driver. He was trying to right notes to us in Czech, while driving like a madman, and yelling “Communist! Communist!” at the other drivers. We really hadn’t signed up for an adventure tour. But it kinda felt that way! After touring the church in Sedic, our driver couldn’t be found. So we ducked into a pub to avoid the chill. Eight pints of beer, for six bucks. We dubbed this “the most inexpensive beer in CZ.” Not bad! Good beer too. Overall we found the young Czech people to be open and very friendly. We enjoyed all of our interactions with them. The younger folks are fascinated by US culture and were very interested in whatever we could tell them about New Orleans (our home). The folks our age (am I really middle aged?) were friendly too, once they loosened up. But you could see the effect that growing up under communism had. We found that the older (60’s and up) folks working in the lower service jobs were the worst. Very abrupt, and impatient if you did not speak Czech. But we did not let these few encounters color our opinion of the locals. We found them interesting, bright, and well educated. They have a quirky dark sense of humor too, which we enjoyed. The people watching was great. Someone told me that all Czech’s consider themselves philosophers. I can see that. You could spot the intense young men hurrying along the sidewalk, with a stack of books under their arms. In their beat up blazers and with wild hair perfectly askew, they kinda looked like beatniks. My wife thought they were extremely cute. A thought that I am sure would have offended them greatly! It is a developing economy, and you could almost smell the money. The nouveau riche status symbol seems to be a new Corvette, and we saw several on the street. I hope capitalism doesn’t screw them up too much. They are also still learning to do business. I experienced a couple of miscues as I tried to reserve our apartments. But Prague City Apartments was mostly professional. We were also stood up TWICE for our day trip, with no real explanation or apology. This was very frustrating for someone that works in the travel biz. But I am sure that they will eventually get the hang of it. The architecture was amazing, outstanding, and overwhelming. Very dirty. I am guessing that the communist administration didn’t bother with maintaining anything. So there are some beautiful statues and buildings that are just black from pollution. But we noticed that there was scaffolding everywhere for the cleaning crews. The city has a lot of tourist dollars pouring in, and they are using some of it to clean up their beautiful surroundings. They haven’t got a handle on the air pollution yet. The air was noticeably smoggy. All in all? One of the most fascinating places I have ever been, and I hope to return someday. It has only been twenty years since the fall of communism. It is going to be very interesting to see how the change affects these thoughtful and witty people. I can only wish them well.